The upper part of Glasgow's High Street, and Castle Street to its north, formed the original core of the first settlement here. Little, sadly, now remains of the old town except for the medieval Glasgow Cathedral a little to the east, and on the west side of Castle Street itself, what is possibly Glasgow's oldest house, Provand's Lordship, dating back to the mid 1400s. Opposite Provand's Lordship stands an imposing honey-coloured stone building that at first sight looks for all the world like a much-extended Scottish tower house of a similar age. 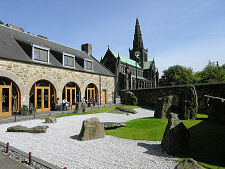 This is the St Mungo Museum of Religious Life and Art: and it comes as a surprise to find it was built as recently as 1993. 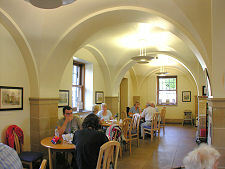 The museum owes its existence to the Society of Friends of Glasgow Cathedral, who raised most of the funds needed to build a visitor centre for Glasgow Cathedral. 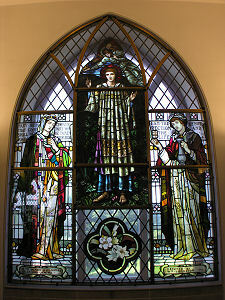 They were unable to complete the project, however, and Glasgow City Council stepped in with a rescue package that allowed the aims of the Cathedral visitor centre to be delivered, but within the wider context of a museum dedicated to all aspects of religion. The result was a beautiful building containing a superb museum. The ground floor is largely occupied by the vaulted cafe and the museum shop, while behind it is Britains first permanent Zen Garden, whose simple forms symbolise the harmony between people and nature. Weather permitting, the paved areas around the Zen Garden form an outdoor dining area for the cafe. 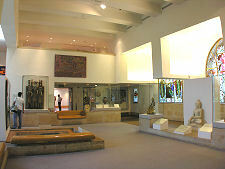 Within the museum are four main galleries. 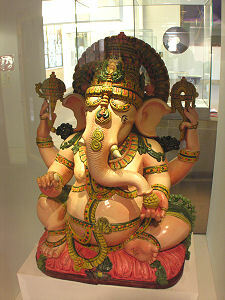 The Gallery of Religious Art forms a huge space within the first floor level of the building. 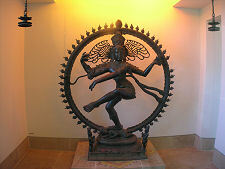 Lit by an excellent collection of Christian stained glass windows, here you find representations of the Hindu god Shiva, Lord of the Dance as well as other world deities and examples of religious art including a magnificent Islamic prayer rug made in Turkey in the 1600s. 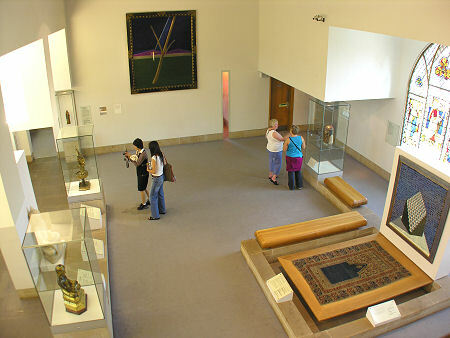 The first floor wing of the museum forms the Gallery of Religious Life, where an amazing range of artefacts represent a wide variety of aspects of religious life. Here displays focus on the role of religious activity in different aspects of the life cycle, whether birth, initiation, marriage, healing or death. 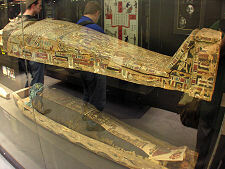 Exhibits include a Nigerian carved figure intended to represent the spirit of smallpox to assist in healing; an Egyptian mummy; a Hindu bridal suit; and a Scottish Christening gown. 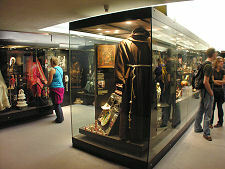 The lives of those taking up religion as a profession are also reflected here, with exhibits ranging from a monk's habit to the garbs of divine rulers. 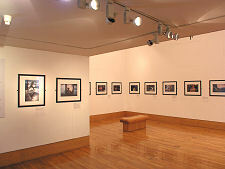 The Scottish Gallery occupies a large part of the second floor. 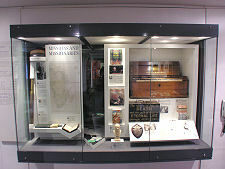 Here you can find exhibits that tell the fascinating story of how religion has shaped the culture and beliefs of people in the West of Scotland from earliest times to the present day. Stands reflect the role in Scottish life of six of the world's religions: Buddhism, Christianity, Hinduism, Islam, Judaism and Sikhism. Here you can also admire the beautiful Sharing of Faiths Banner, celebrating the multi-faith city of Glasgow today. 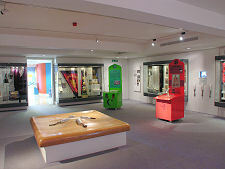 Also on the second floor of the museum is an education area; while a mezzanine floor above one end of the first floor provides a home to temporary exhibitions. 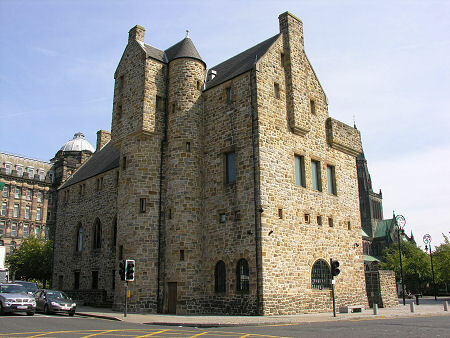 None of the exhibits on display within the St Mungo Museum of Religious Life and Art needed to be housed in a building whose external appearance borrows so much from traditional Scottish castles. 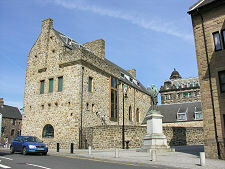 The design of the building is intended to reflect the earlier existence on this site of what many regard to have been Glasgow's second most important building after Glasgow Cathedral, variously known as Glasgow Castle or the Bishop's Castle. This was built some time before 1258 and over the following centuries saw a number of expansions and improvements. By the early 1500s it comprised a large castle surrounded by a 15ft defensive wall, and served as the palace of the Archbishop of Glasgow. The castle saw military action during the tempestuous mid-1500s, being besieged in both 1544 and 1560. 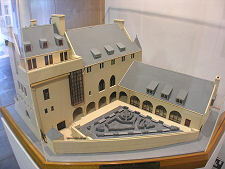 After the Reformation of 1560 it continued to serve as a council chamber and occasional fortress, and after the 1715 uprising enough of it was still standing to house 353 Jacobite prisoners, and the 100 troops guarding them. During the remainder of the 1700s the castle fell into disuse and ruin. Parts were demolished in 1789 to make way for the Royal Infirmary, whose imposing bulk still dominates the area to the north of the museum, and the decision was taken in 1792 to remove the remainder, leaving a site that remained vacant for the next two centuries. There is no doubt that the loss of the Bishop's Castle was one of (many) architectural tragedies to strike Glasgow in recent centuries, as much of the fabric of of an ancient city was swept aside to accommodate the sometimes questionable needs of the moment. But given that the castle had been destroyed two hundred years earlier, we can be thankful that someone had the vision to recreate some sense of the lost precinct of Glasgow Cathedral by building the St Mungo Museum in the form we see it in today. 2 Castle Street Glasgow, G4 0RH.